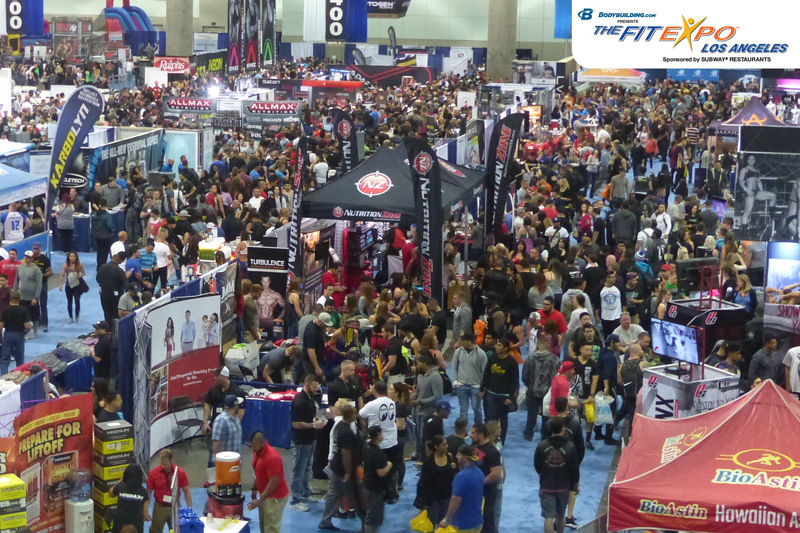 (Los Angeles, Calif…December 15, 2016) The West Coast’s largest fitness event, the Bodybuilding.com TheFitExpo Los Angeles presented by Subway Restaurants, returns for its 14th epic year to the Los Angeles Convention Center, Saturday and Sunday, January 7-8. This ultimate weekend of fitness offers attendees over 20 free competitions, events, workshops and appearances by the top fitness celebrities in the industry. Plus this one-of-a-kind event boasts 700 exhibits featuring the latest in fitness, diet, nutrition, strength and wellness products and services with show discounts and tons of free samples. During both days, many leading fitness professionals will provide hot training tips, informational seminars and exciting demonstrations. Headlining guests include Jay Cutler (4X Mr. Olympia Champion), Billy Blanks (fitness icon and creator of the Tae Bo exercise program), Tito Ortiz (celebrity MMA fighter and UFC Hall of Famer), Kali Muscle (bodybuilder with 16 million views on YouTube for “Kali Muscle Story” and successful author, actor, philanthropist, motivator) Massy Arias (Internet bodybuilding sensation with 2.3 million Instagram followers), CT Fletcher (6X World Champion Powerlifter), and Dana Linn Bailey, (first Ms. Physique Olympia 2013). Plus, NBC-TV’s Strong stars Chris Ryan and Wes Okeson will give everyone a chance to sign up on-site and flex their muscles and go through a fitness obstacle course. Box ‘N Burn – Get your the boxing gloves on as Olympic bronze medalist and former undefeated professional Boxer Tony Jefferies with co-owner Kevan Watson and their team of world class trainers offer fundamental boxing tips, special conditioning workshops and fun competitions throughout the weekend. The Muscle Contest Challenge presented by Rule One Proteins and produced by Lindsay Productions, will feature Bodybuilding, Physique, Figure & Bikini Classic Championships. This NPC-sanctioned national qualifier offers a variety of competition classes from men, women, open and novice to masters and teens. Judging begins at 11:00 a.m. with finals at 3:00 p.m. Entry deadline is December 31, 2016. Row your way to health as Heart Rate Training by Orangetheory Fitness offers row challenges all weekend at the Expo. Several jaw dropping fan favorites return including: Odd Haugen Strength Classic, The USPA American Cup Pro Powerlifting Invitational presented by Iron Rebel, The Ironmind Viking Visegrip World’s Record Challenge, California Armwrestling Championship, Slackline Competition and Bodybuilding.com’s BodySpace™ Spokesmodel Search. Attendees get the chance to win prize money and bragging rights as TheFitExpo’s Best Attendee and GAT Sport’s MAXREPS Attendee Competitions are back, with cash and prizes to the winners. Come dressed to work out as TheFitExpo brings free mini-workouts, demos and fitness challenges daily on Group Training Zone Stage. The area’s top fitness professionals will offers sample sessions in Coed Crunch-Partner Workout, Studio SWEAT onDemand, LTO Fitness, Body Blast Bodyweight Bootcamp, The BRUTEZ, R.I.P.P.E.D, Pound Rockout Workout, and more. For the pros, Saturday workshop sessions and 30-minute express workout sessions will provide an opportunity to earn five Certified Education Units (CEU’s). (Separate fee to participate in CEU sessions). For the first time, GROOV3 will present Wow the Crowd – Dance Fitness Instructor Challenge. This high- energy fitness challenge will feature the top five dance fitness instructors in LA going head-to-head to the spinning sounds of the Fit DJ Lauren Pappas. Open to all fitness instructors competing with music from Latin and Urban Hip Hop and Dance Hall to Jazzercise. (Separate ticket required). Other fitness celebrities scheduled to appear include Jeremy Buendia (3X and current Men’s Physique Olympia Champion), Lexy Panterra (founder of LexTwerkOut), rising fitness star of the Get Fit with Katie series, Katie Austin (daughter of fitness industry’s iconic pioneer Denis Austin), Jeff “Popeye” Dabe (National Armwrestling Champion), Christina Drob (current and 2X Pro Bikini Diva World Champion), Shanna and Lou Ferrigno (father/daughter fitness team), the Kristef Brothers (comedy acrobatic balancing duo), Audley Harrison (legendary British boxer and promoter), and many more. The Healthy Living Pavilion presented by Optimum Nutrition and Fitness Fashion Show will return along with the popular Kids and Youth Area. And if you’re extremely fit and want to go pro, leading fitness modeling agency, Naturally Fit Agency, will be conducting a model search all weekend at TheFitExpo. Just bring a comp card, 8 X 10 photo, and a resume and dress in fitted jeans and top/shirt and you will be guaranteed to be seen. Adult admission tickets are $30 per day or $45 for the full weekend. Children 12 years and under are $10 per day and children under 6 are free. Show hours are Saturday, 10:00 a.m. – 6:00 p.m. and Sunday, 10:00 a.m. – 5:00 p.m. Plenty of parking is available. 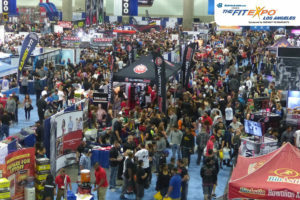 The Los Angeles Convention Center is located at 1201 South Figueroa Street, South Halls G, H, J and K. For full information on TheFitExpo call (818) 545-0290 or visit www.thefitexpo.com. Event is produced by National Fitness Productions. Title sponsor is Bodybuilding.com. 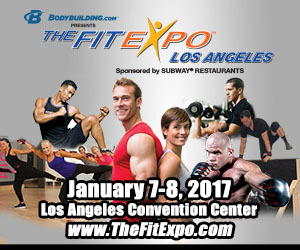 Presenting sponsor for Bodybuilding.com TheFitExpo Los Angeles is Subway Restaurants. Supporting sponsors include: Ralphs, Optimum Nutrition, Quest Nutrition, Gymshark, Muscle Monster, BSN, Performix, Rule 1 Proteins, Rivalus, Barbell Brigade, Nutrishop, GAT Sport, Beast Sports Nutrition, Live Fit Apparel, Iron Rebel, Granite Supplements, Mygympals, NRSM, 361*, and Ironmind.